Portraits of a Fjord Town is a art-science collaboration about material, process and the things collected along the way. It is inspired by the natural landscape, the origins of ceramic glazes and a personal attraction to rock collections. Dana Neilson’s exhibition introduces an exploration of ceramic material from inception to finale, from picking up stones to ceramic sculptures, including photographs, sound, material tests and found objects. This exhibition questions the common idea that the final art piece is the most important or valuable part of an art practise, and highlights the process as just as interesting, provoking and relevant. This series of work was created while Artist in Residence at Skaftfell Center for Visual Art in Iceland. 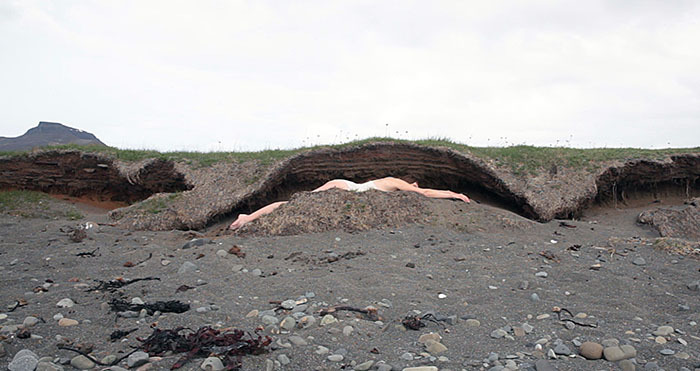 In her video work Closer to (My) Nature Dana Neilson explores natural shapes and environments molding her body to them as opposed to the ubiquitous human drive to give shape to the land. Intersecting physical environment and interior self this video piece provokes dialogue between landscape and the human body. It encomapsses a meeting point, in this case of land and body, of earth and soul, a rediscovery of nature. Weird are all the angles, all the straight lines; all the divisions between humans and the natural world.